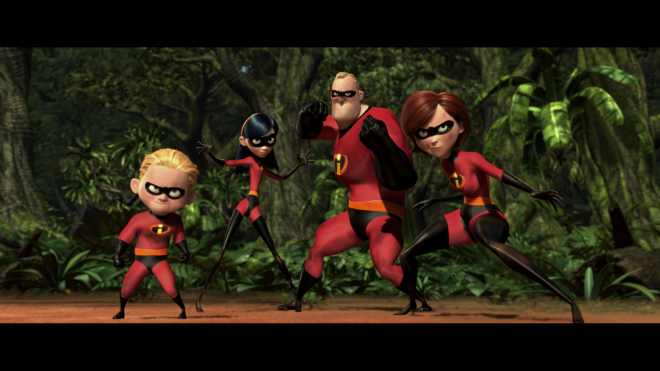 A unique and highly entertaining family flick with smarts, Pixar's The Incredibles is a terrific look at the humdrum of suburban middle-aged life, packed with tons of explosive action and a heartwarming theme about valuing one's family. The 4K Ultra HD Blu-ray comes to the rescue with incredible 4K HDR10 video, a demo-worthy Dolby Atmos soundtrack, and an excellent selection of supplements, making the overall package Highly Recommended for the supers of our family. 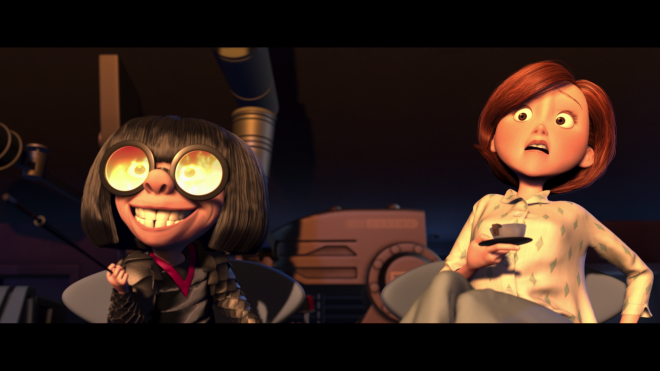 Pixar's The Incredibles is the coolest, if not the best, film commentary on middle-aged life, of settling into a comfort zone that feels horribly routine and drearily mechanical. And best of all, the computer-generated film presents the idea as a larger-than-life allegory with superheroes. Writer and director Brad Bird pumps up the animation world with an intelligence and substance not often seen in family-friendly fare. Disguised as an action-packed, relax-in-your-seat popcorn treat, the movie comes with a wonderfully engaging story about a very different kind of mid-life crisis. But the experience and the yearning for more are universally felt as we enjoy the amusing adventures of one family with superhuman powers. Five years earlier, Bird gave audiences another smart animated feature with the heart-warming The Iron Giant, which took place in 1950s Cold War America. 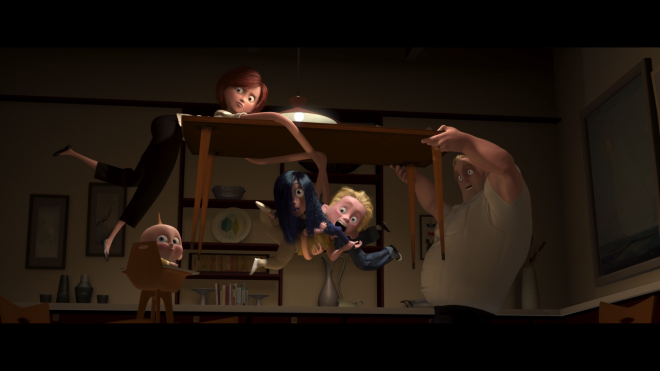 The Incredibles is set in a kitschy, retro metropolis that feels like a mix of vaguely familiar comic-book stereotypes. These elements are put to great use as the movie opens with a burst of youthful, vibrant colors and a wild, zestful energy. Taking a cue from the Watchmen mythology, masked avengers are forced into early retirement after various unasked-for rescues lead to several ungrateful lawsuits, which all coincide with the secret marriage ceremony of two popular superheroes. Suddenly, the picture changes to bleak and lifeless with a dull gray overtone, obviously signifying a vastly different state of being. 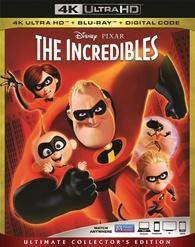 Walt Disney Studios Home Entertainment brings The Incredibles to 4K Ultra HD Blu-ray as a three-disc combo pack with an UltraViolet Digital Copy code, which can be redeemed via RedeemDigitalMovie.com or MoviesAnywhere for access to the HD SDR version while VUDU users can have the 4K digital version with Dolby Vision and Dolby Atmos. The dual-layered UHD66 disc and Region Free, BD50 copy sit comfortably on opposite sides of a center spindle while another Region Free, BD25 disc containing the bonus features is on the last panel. All three are housed inside a black, eco-vortex case with a glossy, embossed slipcover. At startup, viewers are taken directly to a static screen with the usual selection along the bottom and music playing in the background. The family superhero team comes to the rescue of 4K Ultra HD with an incredible and generally satisfying HEVC H.265 encode that offers several improvements over its HD predecessor. However, considering how the original source was rendered and any limitations associated with it — it was mastered at 2K resolution with a fixed, somewhat limited color palette — the new 2160p video doesn't completely blow away its Blu-ray counterpart. Fine lines and overall definition receive a noticeable uptick, which is most apparent in the hair and the subtle details of the costumes. Occasionally, viewers might note slightly better clarity in background information or the small rust stains in the robots, but the difference is nonetheless minimal. Added to that, there are several instances of mild aliasing and wavering along the sharpest edges of vehicles and buildings, further adding to the suspicion of the picture coming from a 2K source. Moreover, and perhaps most surprising, is a palette that doesn't display a wider array of colors, looking quite similar to the HD version on the whole. Granted, primaries are slightly brighter and fuller, especially the abundance of reds in the costumes, but it's not the sort of dramatic change we've come to expect. 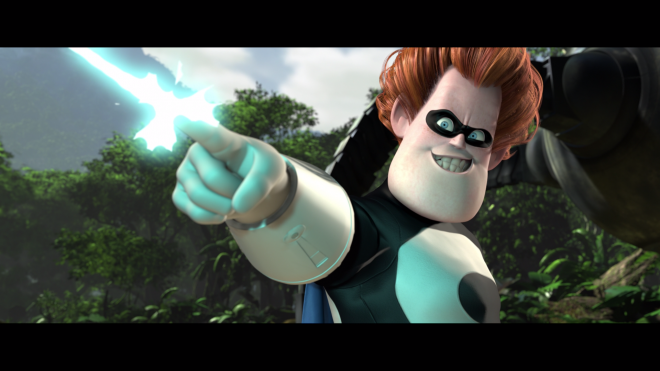 For sure, the yellows and oranges in the costumes and explosions are a tad flashier and truer to life, but the blue in Frozone's outfit and Syndrome's gauntlet beams are of the same electric cyan shade seen on the Blu-ray. The biggest and best improvement, however, is the significantly better contrast, providing this 4K presentation with a considerably brighter charm throughout. The whites in clothing, costumes, gadgets, and clouds come with a more glistening, lustrously sterilized appeal, sometimes almost looking as though the character wash their clothes in highly-concentrated bleach. The tighter, narrower specular highlights supply certain aspects of the picture with a radiant dazzle and sparkle along the edges of clouds, metallic objects or when the sun is beaming on one of the characters. Peak luminance isn't pushed to the extreme, but the improvement is enough to more than satisfy fans. Also, brightness levels furnish the HDR10 transfer with rich, luxurious blacks in the costumes and other outfits while deep penetrating shadows come with superb detailing, even in the darkest corners of the frame, and provide the 2.40:1 image with an exceptional three-dimensional quality. Given some of Disney's recent somewhat lackluster audio mixes (Black Panther, Thor: Ragnarok), I must say I was a little hesitant going into this new Dolby Atmos soundtrack. Thankfully, all my doubts were quickly laid to rest within the first few minutes of the opening action sequence, offering owners of the DTS-HD version every reason to upgrade to this bold, dramatic and heroic fashion statement. Granted, it's not the aggressive sort to go toe-to-toe with the likes of Fury Road, but it nonetheless delivers the superheroism with tons of activity in the sides and rears, creating an enveloping 360° soundfield that's simply marvelous. Whether we're in the offices of the insurance company where Bob works or deep in the jungles of Syndrome's remote island, viewers are immersed in the clear, discrete sounds of ringing phones or the wild cries of exotic birds in the distance. Many of those same effects pan between the speakers and across the ceiling channels with flawless movement, bringing the many cool battle sequences to life like never before and generating an awesome hemispheric listening experience. On several occasions, debris from explosions feel as though raining down from above, the flying discs zoom overhead while chopping through trees, and the electric hum from Syndrome's or Violet's force field can also be distinctly heard echoing above the listening area. The design also benefits from the added breathing room, providing the action with a great deal of warmth and balance between the three front channels. With superb, fluid movement across the screen, the soundstage is littered with a variety of convincing off-screen activity in the background, generating a highly engaging object-based track. Dynamics are expansive and far-reaching, defining the highs and mids with perfect crystal clarity. At the same time, the low end provides action sequences with an earth-shattering and persuasive intensity while vocals remain perfectly balanced and intelligible amid the thunderous chaos. 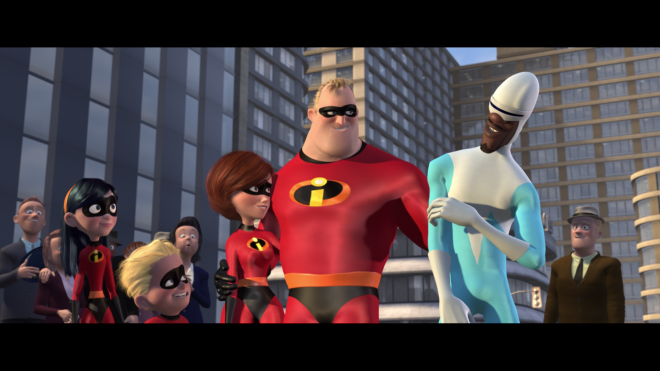 As the first CG animated film to feature an all-human cast, Pixar's The Incredibles is a terrific look at the humdrum of suburban middle-aged life. The story comes with a wonderfully memorable cast of characters and tons of explosive action that will knock your socks off, making this a unique and highly entertaining family flick with smarts. The 4K Ultra HD Blu-ray boasts a beautiful and overall satisfying 4K HDR10 video with a remarkable, occasionally demo-quality Dolby Atmos soundtrack. The same extensive collection of bonus features are ported over, making the overall package truly incredible and highly recommended.